A magnificent presence on the Mekong river, Aqua Mekong showcases modern architecture and interiors by renowned architect Noor Design. The Mekong river cruise ship’s 20 spacious, air-conditioned suites feature full-length windows that offer spectacular panoramas of the ever-changing Mekong scenery. Aqua Mekong also received the coveted Gold Award in the Architecture/New Build category in the 2015 Asia Hotel Design Awards. As the Aqua Mekong charts a luxurious passage across Cambodia and Vietnam, on-board guests embark on an inspired journey of local flavors with a dining experience crafted by Michelin-starred consulting chef David Thompson. The ship’s bar menu, created by renowned spirit experts and cocktail designers Proof & Co, echoes a similar locally-minded philosophy. Aqua Mekong guarantees utmost safety, comfort and exclusivity for off-shore excursions, as Aqua Expeditions owns and operates the only private fleet of launch boats on the Mekong river. The four ergonomically-designed launch boats bring guests on highly personalized day trips to landmarks, temples and villages where tradition, spirituality and craftsmanship reside. A magnificent presence on the Mekong river, Aqua Mekong showcases modern architecture and interiors by renowned architect Noor Design. The vessel’s 20 spacious, air-conditioned suites feature full-length windows that offer spectacular panoramas of the ever-changing Mekong scenery. Aqua Mekong also received the coveted Gold Award in the Architecture/New Build category in the 2015 Asia Hotel Design Awards. 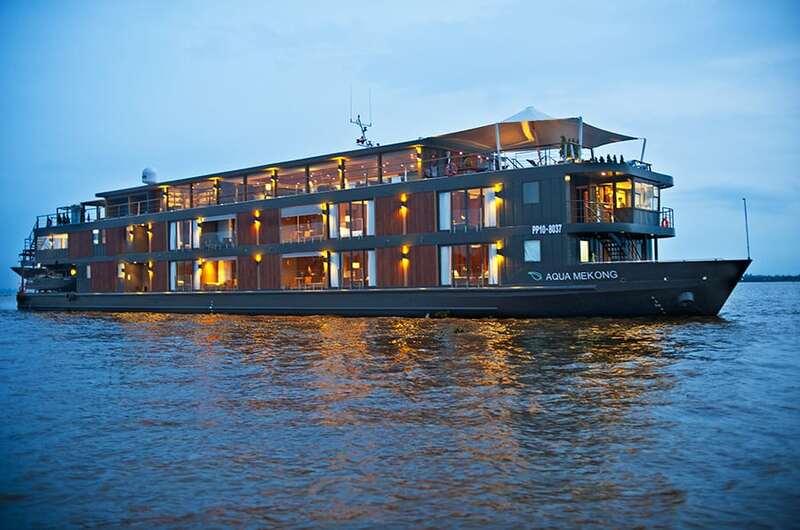 Discover a heartfelt and personalized brand of world-class hospitality unlike any other on the Mekong. Led by an experienced cruise director, the Aqua Mekong sails with a 1:1 crew-to-guest ratio made up of a carefully chosen full-time team. Our dedicated Cambodian and Vietnamese crew delivers five-star personalized service on every journey, with immaculate attention to detail and guest needs enabling every interaction, activity and excursion to be orchestrated to a perfect rhythm. 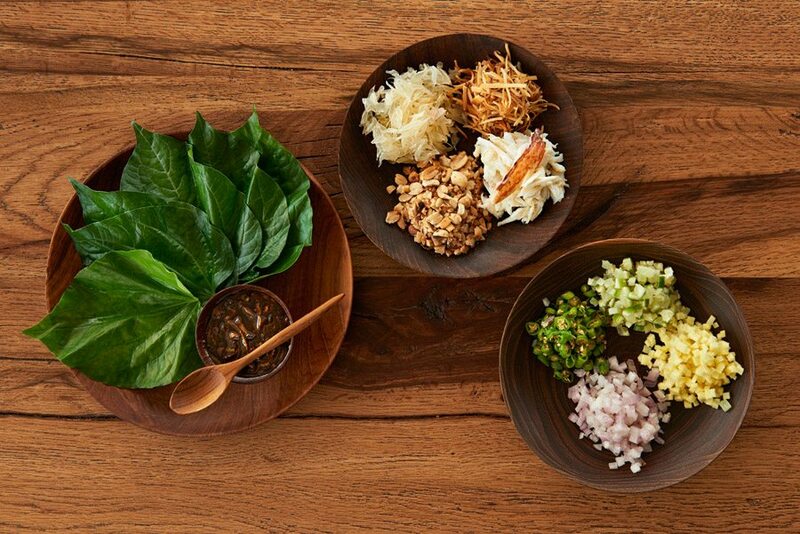 Experience a world-class culinary journey with a menu designed by our Consulting Chef David Thompson, winner of Diners Club Lifetime Achievement Award Asia, who incorporates the diverse culinary traditions of Mekong River cultures with the freshest ingredients to create indigenous inspired dishes. Enjoy the all-inclusive, twice daily shore excursions on 4 private speedboats, equipped with four-stroke low emission engines and with a capacity for 10 passengers. Our ergonormic, comfortable speedboats will bring you deep into the Mekong's tributaries and up close to life on the river, whenever you wish. We are the only Mekong River cruise ship to offer complimentary bikes which you can hop on anytime to explore the picturesque riverbanks of the Mekong River. Observe the exotic rituals of daily life along the mighty Mekong upclose on two wheels, stopping to photograph catfish sellers, the planting of rice paddies or local children playing with the family’s water buffalo. 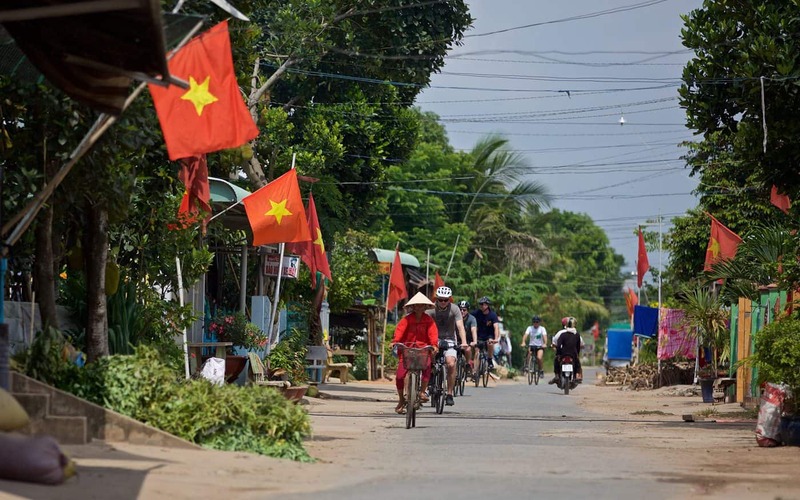 Aqua Mekong passengers have the option of 8 to 15 kilometer biking routes. Ten top-of-the-line Cannondale all-terrain bicycles are provided free of charge onboard for passengers to explore during shore excursions. Passengers are accommodated in 20 Design Suites across two decks. Each measuring 30 square meters / 322 square feet; 8 with balcony and 12 without. 40 crewmembers, including a cruise director, paramedic and 4 English-speaking guides. “We all had an amazing trip. Can’t find anything that we didn’t like. Far better than Myanmar!! Guess the Aqua Mekong was the highlight. We were lucky to have so few passengers aboard which made it very special for us. We also had the Asian manager for Aqua on board for the first half of the trip, along with the interior decorator, the builder, and 3 travel agents. And David Thompson!! All were interesting and friendly. What a treat. As we were always on our own we had our own skiff and guide for excursions. The excursions were varied and interesting and there were lots for the kids to participate in. The bike rides and canoes were in great demand!! I can’t fault the staff, food (yum) and amazing service on board. Catherine and Winks loved the “magic basket” in our cabins where the dirty clothes disappeared every day and returned clean!!! The chef was very accommodating and arranged early meals for the children, often changing the menu for them. Cambodia was our favorite country. Particularly when we crossed the border and the passing countryside became rural. The weather was kind most of the way. Especially on the boat. In Siem Reap (another lovely guide) we experienced what a tropical downpour really was!! The Vesper excursion we did at night to various restaurants was a very wet adventure as was the night we went to the circus!! Also driving through flooded roads and roadside on our way to the airport on Tuesday. We also were able to curtail some of our daily tours. Like reducing the number of visits to eg temples so we could all spend the afternoons by the pool at the Raffles. We were templed out by this time. Our guide named a new temple “Raffles Temple” for the tour itinerary!! But the consensus of the family was it was the best time to go. The big pluses were they we were able to sail up the lake to SiemReap and the relatively small number of tourists. Also the size of the boat. That is a huge advantage. We passed the new Scenic boat while in Vietnam. We looked like a minnow against it. But not our choice of boat. Too big and too white!! “Absolutely AMAZING in every way. We joined the Aqua Mekong for a three night cruise from Phnom Penh, Cambodia to My Tho, Vietnam not far from Ho Chi Minh City. The voyage was perfect in every way. Exceptional service, the most amazing meals, beautiful 5* cabin suite, great excursions and guides, incredibly personable staff, real sweet housekeeping staff, fun on-board activities, a wonderful massage and did I say … exceptional service! This was our second cruise with Aqua Expeditions so we enjoyed their Loyalty Program benefits of room upgrade and a nice surprise of complimentary massages. We sailed previously on their Peruvian Amazon cruise. We were so impressed we had to try another. The beauty of Aqua Expeditions for us is the intimate size of their ships. 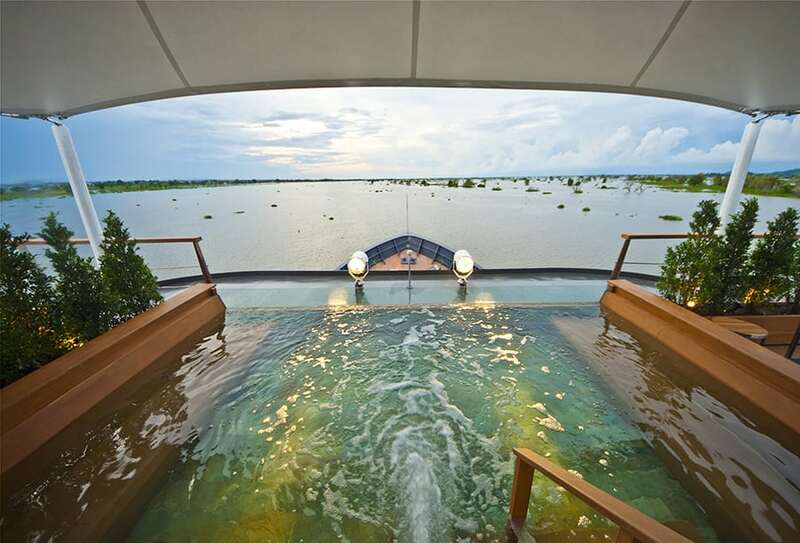 The Aqua Mekong accommodates a maximum of 40 guests in 20 luxury suites. On our sail there were only 10 of us onboard so the staff to guest ratio was off the charts. We spent almost four weeks in Southeast Asia at 5* hotels and this was the first room where we had two sinks. Nice! Great sized bathroom, wonderful shower, very comfortable suite and bed and great views through the floor to ceiling windows. Plenty of space for all our stuff too! The Chefs and wait staff at meals were awesome. They acknowledged our preferences at every meal such as pointing out to me that there were no onions in my dish. Once introduced to all staff we were addressed by our first name every time we saw them. The Chefs’ cooking demonstration was great. The meals onboard were the best food we had on our entire Southeast Asia trip. I brought many of the recipes home with me. I still dream about the Malaysian Laksa. It was so good!! Excursions were great fun. We were greeted by the Captain and crew on every excursion and given refreshing scented towels and a cold drink upon our return. Plus we kicked off our shoes and they cleaned them up and left them outside our suite. The Apsara dancers/entertainment on board was nice. The excursion to visit a local’s home was a delightful and interesting experience. It was a nice surprise to see that the crew had caught up with us to serve us champagne cocktails. The service on board was impeccable. The crew were smiling, attentive and made sure we were awarded with only the highest standard of hospitality. “What an amazing experience, mere words cannot describe how perfect this Mekong experience is and how seamless you make it for us. The service level is off the chars, the ship is magnificent and the added space is so impressive, the food, the shore excursions so very interesting and varied. It is a wow factor beyond words. I thank everyone from the bottom of my heart for giving me the opportunity to experience this slice of heaven. I had the best birthday ever! I met Kim and Anthony, they were lovely but I have to say your crew on that ship are outstanding, each one perfection. I loved talking to all of them as they all have such amazing stories and back grounds. “Thank you so much for a most wonderful experience this past week on the Aqua Mekong. I must say that while I had high expectations I never expected it to exceed them so much. The ship is a beautiful floating resort and an ideal place to explore places few people see, places less touched by modernity and places with beautiful topography, all from the comfort of the luxurious accommodations and living quarters on board. But as nice as the ship is, it is you, the team on board that truly create the experience. The warm smiles, the personalized touch and the simple yet refined dedication to service make the Aqua feel more like a private yacht than an exploration river boat. The intimacy of the hardware is only embellished by the heart and soul infused in your team which I find remarkable to do in such a short time since launch. From the wait staff to the bar tenders, to the amazing tour guides, the house keepers, and the cruise directors, everyone knew us by name after one day, knew our preferences, and always managed to make anything we wanted happen – any time of day. I was quite impressed with the variation of activities you offered, as I was afraid each day would seem redundant. But what most surprised me was how much I just enjoyed watching the world go by on board – and actually feeling amazing staying on board and chilling out rather than rushing to do something every minute. The lectures and selection of movie (sans the tiger one!) really helped bring the destination to life, and I was especially attuned by the philanthropic concepts you introduced on board. You truly have something special and truly opened my eyes to what Aqua is really all about.